GET READY FOR A WHOLE NEW EXPERIENCE WITH YOUR SCBA. Your SCBA is the single-most important piece of equipment you will take into a fire. It needs to be reliable, comfortable and user-friendly so that you can have 100 per cent confidence in your equipment during the heat of the battle. 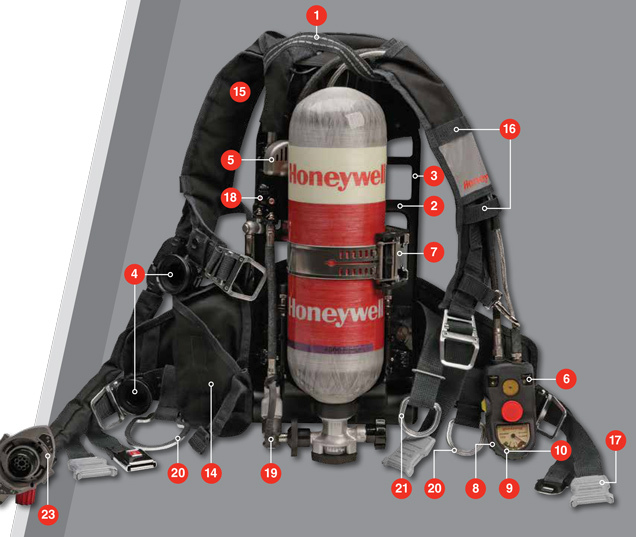 That’s why Honeywell developed TITAN™ SCBA, a new SCBA with advanced functionality for safety, reliability and usability. 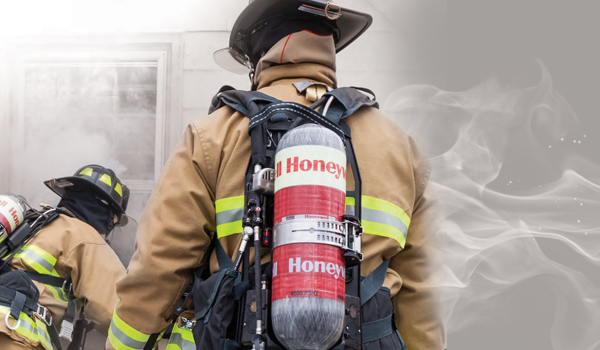 Through extensive collaboration and testing with municipal and industrial firefighters, we designed the Honeywell TITAN™ to be smart, intuitive and easy to use, delivering everything you need in your SCBA — and nothing you don’t. Book a demo with Levitt-Safety today to learn how the TITAN™ can revolutionize your respiratory program today. Carrying handle and strap withstands 1,000 lbs. of pull force for easy carrying and extraction. Lightweight aluminum backplate delivers superior strength and stability and offers 1,000 lbs. of pull strength, with extra cutouts to hang additional gear or rope bag. Four large openings on the backplate are designed as carabiner attachment points and can withstand up to 1,000 lbs. of pull force for extrication. Choice of two loud audible low-air alarms (bell or warbling whistle) located near the user’s ear for easy detection by the user. Visual alarms on the exterior of the LED HUD and front and back PASS illuminate and flash for easy identification in dark, high-noise environments. A simple and reliable lock-and-release system makes for quick cylinder change-outs with one hand. Super bright, bi-color LEDs provide immediate visual indications for sensing or alarm mode. A large gauge is illuminated by two extremely bright white LEDs that blink when the SCBA activates the low-air alarm. Large buttons can be felt with a gloved hand. Audible alarms and visual indicators provide immediate warning for sensing or alarm mode along with a visual low-air and battery status indicator. Two motion sensors, one in the front PASS and one in the back PASS, keep the TITAN SCBA in sensing mode, minimizing false alarms. Easy identification in dark, high-noise environments. 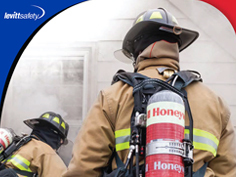 The Honeywell Pathfinder Firefighter Locating System significantly reduces the time to locate a downed firefighter. Four C Alkaline batteries provide power to the front and back PASS, all indicator lights and electronic audible alarms, HUD, and optional Pathfinder locating system. Flexes and moves to adapt to each user’s body contours, and distributes weight evenly. No more slip! Ara-shield® material is integrated into the shoulder straps, providing a tacky surface, yet it allows exceptional movement. Four built-in gear straps can be used for hanging lapel mics, flashlights, or other lighter gear. The first stage pressure reducer’s fail-safe design is simple and reliable, designed to help eliminate snag points. The RIC UAC is angled, eliminating another snag point. It’s located next to the CGA handwheel for easy access. Optional D-rings on the waist belt and an adjustable, sliding D-ring on the lower shoulder strap are designed for carrying additional gear or rope bags. Allows users to adjust the height of the D-ring to the position they need, and makes carrying and reaching equipment easy and comfortable. An optically correct anti-fog lens provides a distortion-free view and unsurpassed peripheral vision. A soft butyl rubber skirt furnishes excellent sealing features, comfort, and durability. LED-style display offers bright readings and an external visual low-air LED. Loud, clear, distortion-free voice amplification with a choice of push-to-talk or handsfree operation.